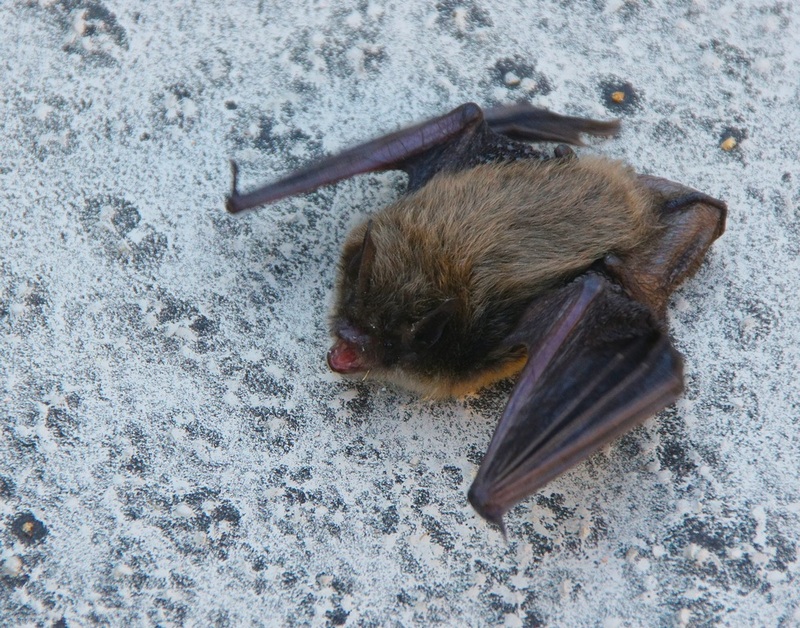 Each year, some Little Brown Bats hang out on the helipad at my work. They don't cause any problems, they just hang out (literally). Each year, I go out and take a picture of them, which I had already done this year. However, one day last week, my secretary (yes, her again) informed me that another co-worker said that one of the bats was down on the ground of the helipad, rather than hanging on the wall. I was a bit wary, considering bats are nocturnal creatures and shouldn't be moving around during the day. Of course, I went out with my camera any way. I was taking photos when I started to see the bat start to stretch its wings. I snapped this photo, just before the bat flew in my direction, flew in circles around the helipad, and then finally settled on a wall. Now, we keep an eye on that bat. The others just stay in one corner and don't move around. We're a little concerned about the one I photographed. He posed for the photo. It is a difficult animal to be photographed. Now, I'm following your blog too. Such a furry and lovely creature! Sweet!!! I remember LONG AGO in biology class on a spelunking field trip where we were surrounded by them. And their wings...just like soft kid glove leather!!! They're amazing critters. Loved this post. Posing for pictures! It's that time of year, you know. Soon they'll be abandoning the helipad and visiting residential neighborhoods to help children spook their neighbors! PS: My verification word is "spidar". Interesting, though poorly spelled, word for Camera Critters day. Good shot, but do be careful ... bats found on the ground during the day are usually sick or rabid. I've always been fascinated by bats. Handy insect eaters! Interesting shot. Got its mouth open even. But why do I get the impression there is more to the story? I hope the bat is ok, it is odd that he has been excluded and somewhat shunned. Great shot though. I hope the bat is OK too, I heard a lot are dying from a disease. Great capture. Thanks for hosting another week of Camera Critters. I hope you are having a great weekend! It really is a unique position for a photo. You don't often see bats like that, on the ground. My nephew is getting his PhD on bats at Hebrew Univ. Jerusalem. Ugh, creepy. I know bats are good for the environment, but that still doesn't make them "not creepy". I had a run-in with a bat that got in my basement in my Ohio house once. My dalmatian was down in the basement and I could hear him running around, finally checked it out, and he was chasing a bat!!! The ex-hubby knocked it down with a broom, took it outside and when we checked 5 mins later, it was gone, so he obviously didn't hurt it!